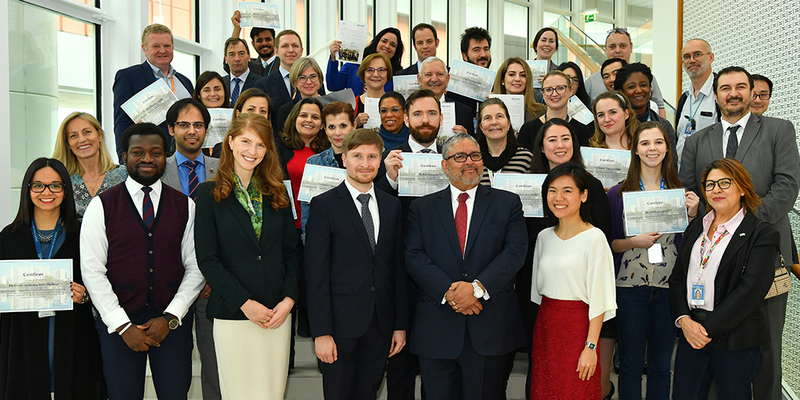 Mentors and mentees came together at an event last week to celebrate the closing of the second mentoring programme – a collaboration between the IAEA and the United Nations-Nuclear Young Generation (UN-NYG). A mix of returning and new mentors participated in the six-month programme, which ran from September 2018 to March 2019, and involved 38 mentor-mentee pairs from three Agency locations; IAEA Headquarters (VIC), the laboratories in Seibersdorf and the laboratories in Monaco. All mentees received a completion certificate signed by the executive sponsor of the programme, Deputy Director General and Head of the Department of Management, Mary-Alice Hayward. The mentoring programme provides a unique platform for young staff members to strengthen their professional skills and improve networking capacity through the cultivation of cross-departmental relationships. The programme is built upon three pillars: knowledge transfer, professional development and networking. The first season of the programme ran from October-December 2017 and involved 27 mentor-mentee pairs. The second season of the programme was structured in two phases. The first half featured interactive workshops lead by specialists in MTHR, which covered a wide range of professional development concepts such as ‘Managing Your Personal Talent’ and ‘Resilience for Professional Life’. The second half of the programme encouraged mentor/mentee pairs to meet on their own initiative according to their schedules. Mentors and mentees in the programme both highlighted its positive impact, and more than half of the pairs said they intend to continue their relationship informally. The third round of the mentoring programme will be launched later this year, with details for participation to be announced on InSite.